Looking forward to Valentine’s Day, this week’s Dark Days Challenge is to make a special dessert from local ingredients according to the rules that we each set up in the beginning of the season. 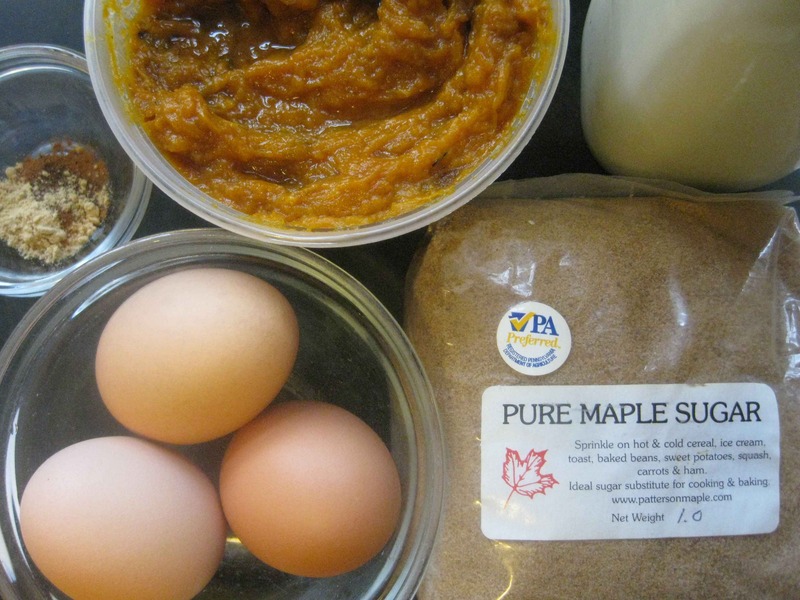 At first I thought this would be really hard, but it turned out not to be once I realized that I would use dairy ingredients and either local maple sugar/syrup or honey as a sweetener. 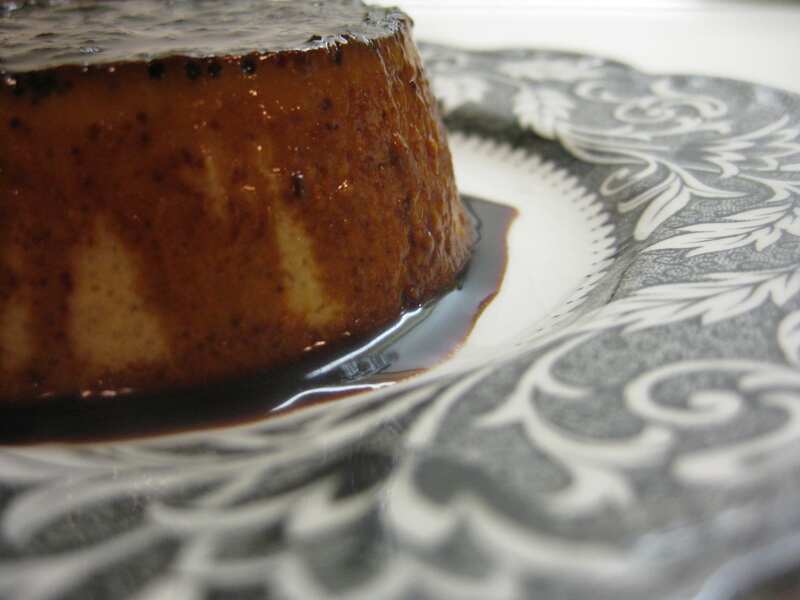 I decided to make a pumpkin flan (with permitted spices) rather than a plain one since I needed to clean out my freezer and use up the pumpkin puree from the holidays. I still have more fresh pumpkin and squash so I’ll be happy to have the freezer space. Especially since I have another Valentine’s Day dessert coming up! Preheat the oven to 350 degrees. 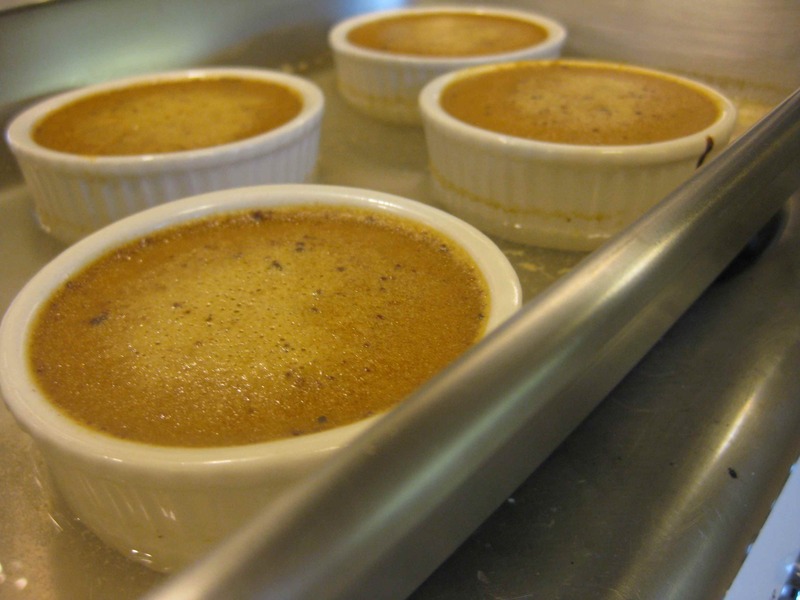 Place 4-6 ramekins, each holding ¾- to one cup, in a shallow roasting pan with 2-inch sides. Heat some water in a teakettle (which will be for the pan when you’re baking the flan). Place a small bowl of cool water and a pastry brush near the stove. Get all of the ingredients measured and ready, and set out the equipment. First make the caramel. Place the sugar and water in a small saucepan over medium heat, stirring to dissolve the sugar. As soon as it boils, stop stirring, but lightly brush the sides of the pan with water to prevent sugar crystals from forming. Swirl the pan a couple of times and cook until the caramel turns dark brown. This will take about 3 minutes for maple sugar, about 5 or so for white sugar. Immediately spoon the caramel into the ramekins. It will harden and may not completely cover the bottom before it does. Make the pumpkin custard. In a saucepan, whisk the milk, cream, pumpkin, spices and salt and heat it just until it starts to bubble around the edges. Pour it through a fine mesh strainer set over a bowl, pushing down on the solids to push them through and create a smooth liquid (this is important if you have roasted your pumpkin and are not using canned pumpkin). Whisk the eggs, add the sugar and continue to whisk until smooth. Add a little of the warm pumpkin mixture, being careful not to cook the eggs, and then mix everything together, beating well. Spoon into the ramekins. Place the roasting pan containing the ramekins in the middle of the oven and carefully pour hot water into the pan, to come about halfway up the sides of the ramekins. Bake for 35-40 minutes until the custard is set but the centers are still wobbly. Remove the pan from the oven and let sit for 10 minutes before carefully removing the ramekins to a rack to cool. After they are cool, refrigerate them for at least 2 hours, or even overnight, before unmolding them to serve. Makes 4-6 servings depending on the size of the ramekins.